At Olin, we’re always rethinking the curriculum in ways large and small to improve the learning experience. The Curriculum Innovation Fund, and other donations, make these improvements possible. This year these donations helped remake the shop, create new courses and spread educational innovation. Oliners like to think big. The ambitious goal of “Making the Shop,” the summer 2017 project involving six students, two faculty members and three staff, was nothing less than “imagining and building the future of fabrication at Olin” and “manifesting the power of student collaboration in the design and creation of learning experiences and environments,” according to the project website. As part of the Curriculum Innovation Fund-supported project, the team organized the tools, rethought the mini-shop, created an advanced woodshop and improved the training process and documentation. They even created a “culture document” spelling out the expectations for the use of the space — all with the objective of making the shop more accessible and inviting. It seems to have worked. Training is up significantly and average usage of the shop has increased two- to three-fold. Moreover, the project is changing Olin’s shop culture. Team member Liz Leadley, a junior who previously didn’t spend much time in the shop, has become a regular. All of this is a foundation for continual facilities improvement and a more seamless integration of fabrication into the curriculum. A team of students, faculty and staff spent the summer of 2017 rethinking and improving the Olin machine shop to make it more welcoming and integrated with the curriculum. Seven curricular innovation projects began in the summer of 2017, thanks to support from the Curriculum Innovation Fund. An interdisciplinary integration project initiated the previous summer continued with an investigation of a new, integrated approach to Olin’s introductory laboratory science courses focusing on the Materials Science and Biology foundations. Other projects concentrated on renovating existing courses such as Quantitative Engineering Analysis, which continues to evolve as it enters its third experimental year, and Modeling and Simulation. New courses are also under development, such as Biomimicry and Computational Biology, which will be added to the curriculum over the next year or two. “Curricular innovation is one of the distinguishing features of Olin, and the Curriculum Innovation Fund is a major factor in helping us continue pushing the envelope in this area,” said Rob Martello, professor and associate dean for curriculum and academic programs. 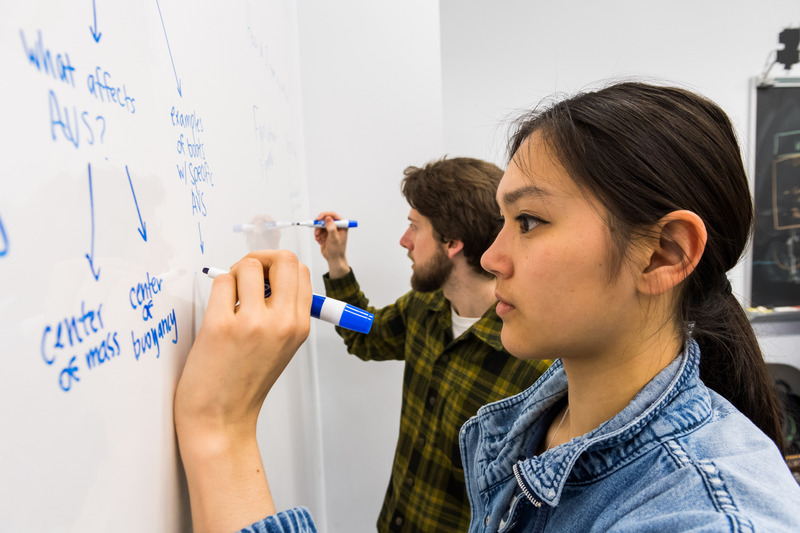 The Curriculum Innovation Fund continues to help improve courses like Quantitative Engineering Analysis, now entering its third experimental year. - The ongoing Argosy fellowship brought to Olin two scholars per semester to immerse themselves in the Olin faculty experience. In addition, it supported research on partnerships for sustainable change in engineering education and the testing of new models for collaborative educational change. - A grant from Boeing supported the important visitor program, which brings 3 – 5 institutions to campus each week to experience Olin’s unique culture and spark ideas. - The Kern Family Foundation expanded the capacity of the Collaboratory by supporting its transformational work with engineering and other educators. Some of the Collaboratory’s most impactful work was done at the signature Summer Institute, during which almost 70 faculty from institutions around the world traveled to Olin’s campus to work with Olin faculty on designing student-centered learning experiences. Donations helped support this event as well, helping to catalyze change in engineering education. “This was hands-down the most valuable and amazing conference experience I've had!” stated one Summer Institute participant. “I learned a new vocabulary and gained a new toolset to think through problems,” said another. Sixty-three educators from 18 institutions representing 10 countries participated in the Collaboratory’s 2018 Summer Institute, Designing Student-Centered Learning Experiences.